Dallas Hotels Ideally located minutes from DFW International Airport and near Cowboys Stadium in Arlington. Hotel has easy access to the DFW airport & the New Cowboys stadium. 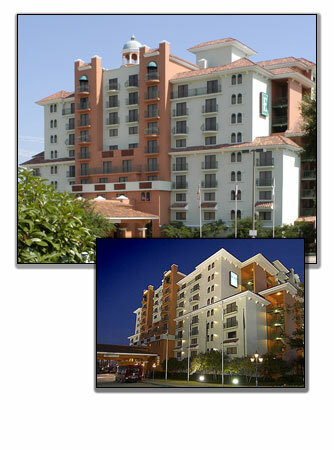 The Embassy Suites Dallas Hotel Airport South is ideally located minutes from DFW International Airport. Local shopping includes Grapevine Mills Mall and Irving Mall. Just a few miles from the Hotel is Texas Stadium, home of the Dallas Cowboys; Texas Motor Speedway; and Ameriquest Field, home of the Texas Rangers. Nearby attractions include Six Flags Over Texas; Lone Star Park, site of the 2004 Breeder's Cup; West End Market Place; the Mesquite Rodeo; Dallas and Fort Worth Zoos; the Fort Worth Stockyards; Dallas Museum of Art; and Fair Park, home to Big Tex and the Texas State Fair! Our Mediterranean style high-rise features a 10-story tropical garden atrium complete with waterfall and exotic fish! An indoor pool and heated whirlpool are sure to delight kids of all ages. For exercise enthusiasts we have a workout room with state-of-the-art cardiovascular equipment. Free parking, complimentary newspaper, room service, guest laundry, wheelchair accessible accommodations and express checkout are just a few of the amenities you will enjoy during your stay. A full-service business center features color copier, computer stations and office supplies. A complimentary, full cooked-to-order breakfast is served each morning in the Atrium Cafe. A manager's reception is held each evening featuring your favorite beverages. Every suite is a spacious, two-room suite with plush decor and private bedroom with king-size or two queen-size beds as well as a queen sofa bed in the living room. Wet bar, refrigerator, coffeemaker and well-lit dining/work table are features of every suite. Other amenities include dual-line telephones with modem hookup, internet connection featuring T1 access, two remote control TVs and in-room movies, hair dryer and iron with ironing board.